For the upcoming #readpawty, I just finished "Dewey's Nine Lives: The Legacy of the Small-Town Library Cat Who Inspired Millions" by Vicki Myron with Bret Witter. 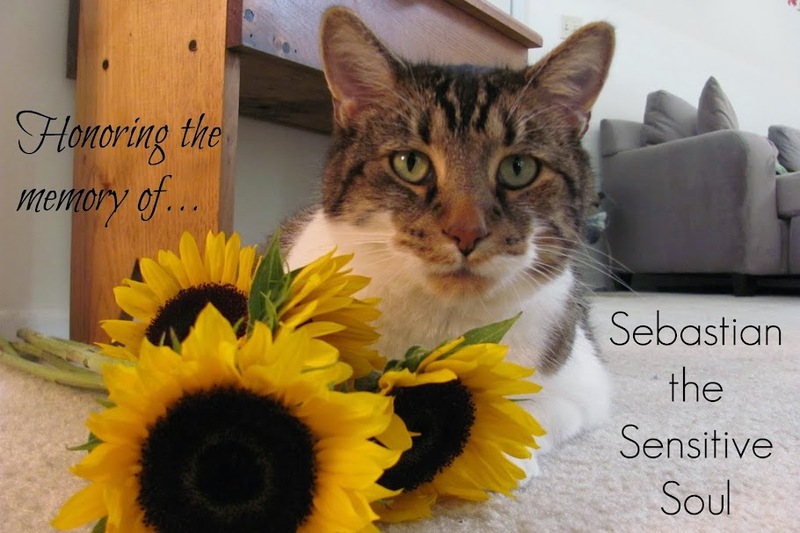 It is a follow-up to their best-seller "Dewey: The Small-Town Library Cat Who Touched the World." "Dewey's Nine Lives" tells nine stories from people whose lives were touched not only by Dewey (either in pawson or through his book) but were touched by cats in their own lives as well. These aren't simply cat stories, either. They really reveal the person and what their life is like. It's not always pretty, but the story is more complete that way. My favorite story was about all the cats living at the resort on Sanibel Island. What a wonderful life they had! Mom really liked the last story-there was a surprise twist, so I won't give it away. I knew it really touched her though by the way she said "Ohhhh!" This was a great book, but I would suggest you read "Dewey" before you read "Dewey's Nine Lives". You'll need your tissues for both! There are also some children's books about Dewey: "Dewey: There's a Cat in the Library"; "Dewey: The True Story of a World-Famous Library Cat"; and "Dewey's Christmas at the Library". If you want more information about Dewey, you can check out his website at http://www.deweyreadmorebooks.com/ or the website for the Spencer Public Library, where he was abandoned, found by Ms. Myron, and lived for many years. Dewey is one cool cat! Read his books and tell me what you think! 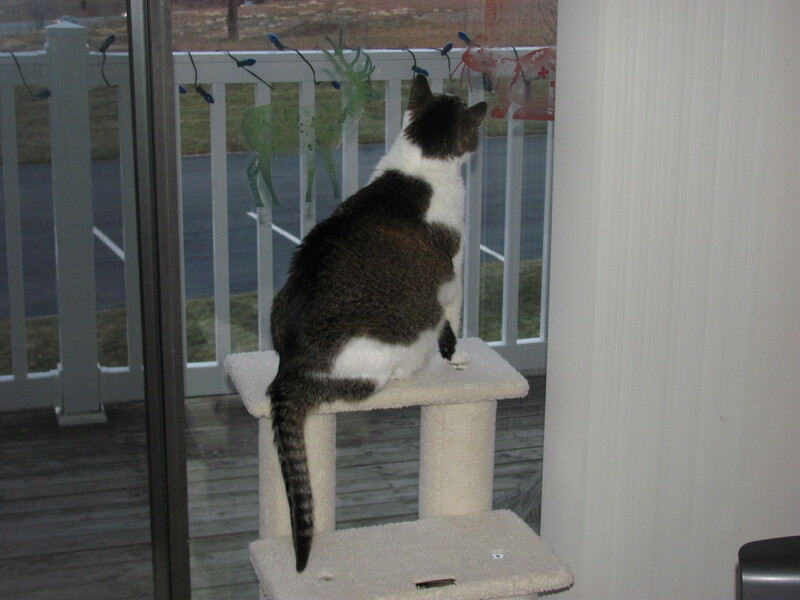 Wordless Wednesday-Could Ya Move the Futon Closer to the Window? I had the BEST day yesterday! It was filled with cuddles, kisses, treats and lots of time with my anipals! I played with my toys. And that secret in the bag? Was a catnip plant! It was the best birthday ever! Thanks for making it special, everybody! Now I need a nap. Today is my 8th birthday! I realize that I've had seven birthdays before this, but this one is special. It is my first birthday in my forever home with Mom. I know she has something special planned for tonight, but she won't tell me what it is! I think it has something to do with whatever is in this bag. She went to PetSmart and came back with the bag, but never took the stuff out of it. I'm not supposed to get on the table, so I can't peek in it either. 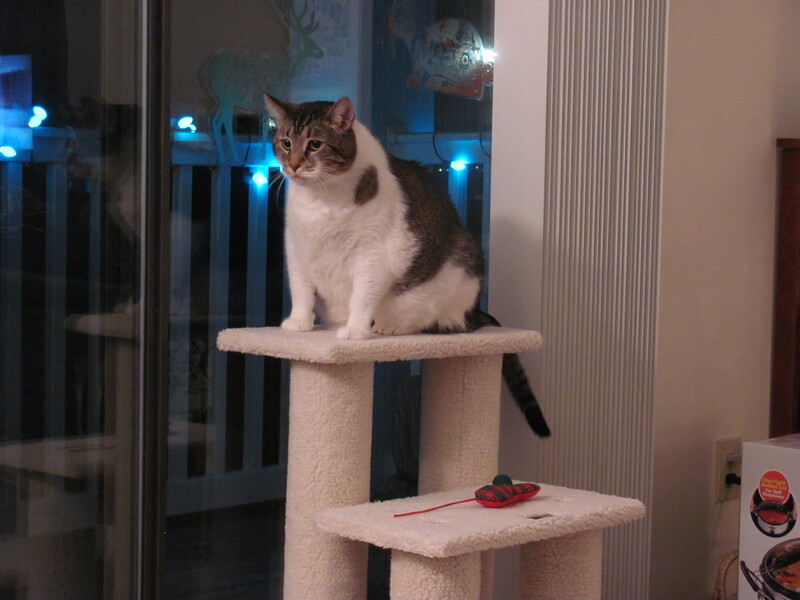 One thing I do know is that I get to play on Twitter tonight with all of my anipals! Mom said I could tweet as long as I want to. I hope everyone joins me for my birthday pawty on Twitter tonight! I'm even going to bring my sisfur Dottie with me. See you later! For today's Blog the Change for Animals-started by the great folks over at Be the Change for Animals-I was thinking about posting about Wayside Waifs. You guys know how important Wayside has been in my life. That's where I met Mom and where she volunteers. They have the best people over there. You can even read what my pal Ryker's mom had to say about them in her Blog the Change post today. Since I talk about Wayside all the time, I decided to post about a different local group. There is a grass-roots organization in Kansas City, MO called Chain of Hope. It was started by Kate Quigley in 2010 as a way to reach dogs in the inner city that are chained; without shelter, food or water; neglected; or homeless. She and her volunteers will drive around until they find a dog who needs their help. They will provide a lighter tie-out for the dogs on heavy tow chains. They will give dog-houses with fresh hay to dogs living in mud with no protection from the elements. They will feed and water dogs whose owner's aren't able to care for them. They don't just care for the dogs though. They also provide education. They knock on doors and talk to the dog owners. If the owner will agree, they will take the dog to be spayed or neutered. Sometimes, the owner will give up the dog altogether and Chain of Hope will foster it until it finds its forever home. Situations are not always that easy to deal with though. If a dog is completely neglected and the owner can't be reached, they will call Animal Control and report the situation. Other times, it is too late for the dogs that Chain of Hope encounters. They might find them near death and the only way to help is to get the dog to a vet so it can be humanely euthanized, rather than suffer any longer. Chain of Hope regularly holds fund-raising efforts to help sustain the organization. Mom went to one not long ago at a local bar. Many people came and brought food, treats and most importantly, cash. She met Ms. Quigley there and was amazed at what this one woman has been able to accomplish. She sees her as a hero, somebody to strive to be like. Ms. Quigley is an inspiration and a model for what all humans can do to help animals. Like her quote on the front page of their web-site says, "...if we can change the life of even one dog, it matters." You can learn more about them and "Like" their Facebook page. You can also read their blog. My favorite story was a recent one about Jackson, who they helped to reunite with his owner. If you are in the KC area, I hope you will support Chain of Hope. Get to know them, spread the word, donate and maybe even volunteer. And for my kitty friends-don't worry. Ms. Quigley feeds the felines she comes across too! The cool humans at Go Pet Friendly and Will My Dog Hate Me came up with this fun challenge. They came up with questions that let all of us pet bloggers get a little history on one another. Even though I'm pretty late to the party I wanted to join in, so here goes! I began my blog in April of last year. 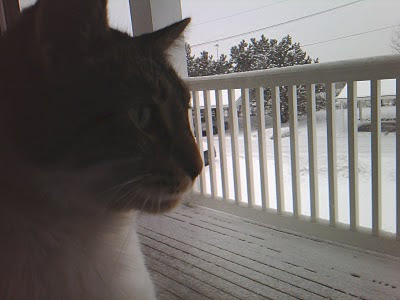 I just wanted a place to share my thoughts and ideas with other anipals and their humans. Yes, mostly. I love to share what's going on in my life, but I've expanded my purpose a bit. I also enjoy sharing thoughts on pet adoption and how we can improve the lives of homeless pets in shelters. Pretty much just as the spirit moves me. I have tried to set a schedule for myself, but it's hard when I have to rely on Mom to type for me. No, I'm not really interested on generating income from it. I like the connections I have from it and sharing ideas. That's all I need from my blog! In general, I like having an outlet for my stories and ideas. What I like most about my blog is how laid back it is. I try to share happy thoughts and neat ideas for helping your local shelter. I think that my blog is good for bringing a smile to my readers' faces. Sometimes I feel like it's hard for me to keep up. Mom and I don't always have time to write, even though I've got lots of things I'd like to write about. Also, I worry that I'm not making the most of my blog because we're not very computer smart. That's why I'm sending Mom to BlogPaws again! Lastly, I get frustrated by not knowing how to gain more readers. I'm thinking of changing my layout a little bit. I wonder a lot if the color scheme is too dark and if the columns are too narrow. I've already made one change-Mom got me a custom domain! I think I'll be easier to reach now at http://www.seabasscat.com/. Now I just need to get new cards made! Review of "Dog Blessed: Puppy Mill Survivor Stories"
I read Main Line Animal Rescue's "Dog Blessed: Puppy Mill Survivor Stories" by Lisa Fischer, published by Happy Tails Books. It is a compilation of stories told by dog owners who adopted their pooches from Main Line Animal Rescue in Pennsylvania and are members of MLAR's rehabilitation group called "Over The Mill". The stories are sad and uplifting all at once. These doggies were all rescued by MLAR from puppy mills and came to the rescue group (and eventually their forever homes) with varying degrees of physical and emotional issues. Many of us know what goes on in puppy mills, but it is still saddening to hear these very personal stories of what an individual doggy goes through in these horrid living conditions. To then read about the people who bring these dogs into loving homes and the patience they show in teaching the doggies that it is okay to be loved is inspiring. I love each of the humans who have rescued, rehabilitated and adopted these doggies. I hope that these stories reach humans far and wide so that puppy mills will one day be a thing of the past and we can rest easy knowing that no more doggies are being harmed or mistreated. Remember when shopping at a pet store that you don't know the conditions of the place the puppies came from and what you may be supporting by purchasing one of these dogs. 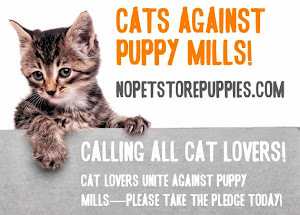 ADOPT, DON'T SHOP! There are other Happy Tails Books too. They not only look like enjoyable books, but Happy Tails Books donates at least 25% of their profits to rescue groups. It's wonderful to see what people are doing for our anipals and I hope you will pick this book up as well! I received my copy of this book at no cost to me from the publisher. This in no way influenced my review of the book. Sebastian loves to sit on his cat tree and look outside. He can see much better now that he is off the floor. He also plays on it, running up and down. It's great for him to nap on as well. Recently when Mom was volunteering at Wayside Waifs, another volunteer brought in some fleece blankies she bought at a STEAL! 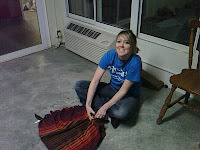 Her idea was to make some no-sew blankets-you know, the kind that are tied all along the edges. They were going to be especially for the kitties waiting for adoption. Mom thought this was a great idea and so did a couple other volunteers. They got right to work in the sun room at Wayside. They wanted the blankies to be purrfectly kitty-sized, so they took each blanket and cut it into four blankets. Then they took the different patterns and put them together so they would look nice with a solid color on one side and stripes on the other. 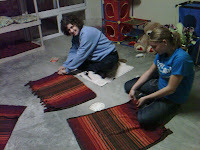 They giggled and laughed the whole time they were making the kitty blankies. None of them knew what they were doing, but boy did they have a good time! Even one of the available cats helped them. This is Simba holding down some material for Lindsay. He checked out all the blankets and made sure they were comfy enough for the kitties. 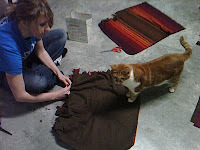 It took a long time, but soon they had four blankets done and they all gave the blanket they made to a special kitty. Simba got the one he helped Lindsay with. Mom gave hers to Anderson. Aren't volunteers the best? They all love the kitties very much and make sure they have something special, something that is just theirs, while they stay at Wayside Waifs. 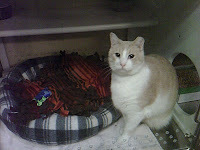 In fact, Anderson is going to get to take his blankie home with him when he finds his forever home-Mom said so!